Built as tangible symbols of repression and control, by the 18th century castles were more likely to be invaded by tourists than soldiers. When castles lost their military function, the crowds arrived, looking for history that was not there. Illustration from Walter Scott's The Bride of Lammermoor, 1819. Until quite recently, if you were making your way to a castle it almost certainly was not with a smile on your face. Combining the roles of courthouse, prison, lordly home and stronghold, castles epitomised a relationship between those within and those without that was hierarchical at best and despotic at worst. Far from being a welcome or comforting sight, they were often the source of considerable misery, whether for those held against their will within them, the soldiers who attacked or defended them, or the local population kept in line by them. Why, then, did so many Romantic writers get whipped into fervour over them – and when did people shed the dread, and start visiting castles for fun? Ever since they first came into being in Europe in the 11th century there is little doubt that castles were a source of awe. At some point, however, they changed from being feared social, political and martial institutions into spectacles to be adored and admired. Scotland provides an ideal case study for this process. With well over 2,000 castles and tower houses still standing to some extent, the international perception of Scotland is inextricably linked with its castle architecture. The first castles in Scotland, however, were met by many not with enthusiasm but with resentment. Fortified sites such as hill forts and brochs had existed in Scotland for thousands of years, yet the castle was something new: an overt power play by the emerging feudal order that became entrenched in the wake of the Norman Conquest. Castles were a way for Scotland’s kings to stamp their authority on the fringes of their kingdom, with the majority of early motte-and-bailey castles being constructed on frontier zones between the nascent Kingdom of Scots and semi-independent Gaelic regions such as Moray, Argyll and Galloway. These castles were often systematically attacked by aggrieved locals, such as during the revolt of the Gallovidians against Alexander II in 1235. Scotland’s castles have long been destinations of note, but for different reasons than today. In 1296 Edward I of England conducted a tour of intimidation throughout Scotland, first brutally sacking the wealthy trading centre of Berwick before proceeding as far north as Elgin. During this campaign it is recorded that ‘only once was the English king compelled to sleep under canvas’ for lack of a local castle to lodge in. 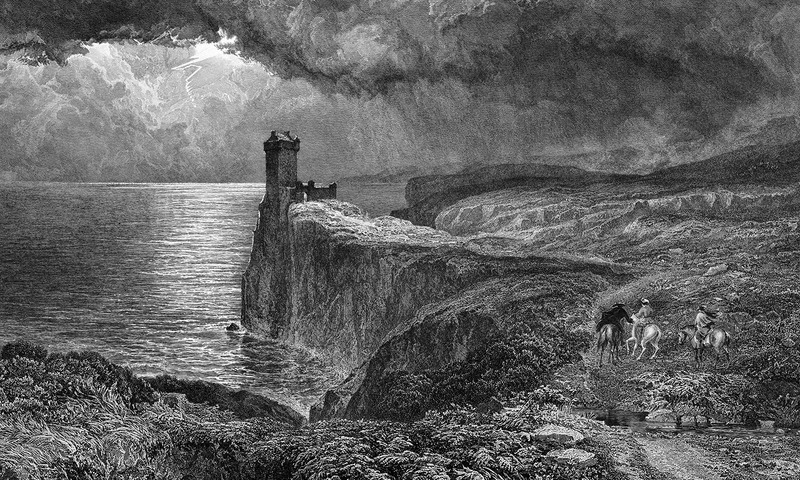 Of course, Edward was not in Scotland for the sightseeing – castles were essential to holding the land; their lord’s submission was all that Edward was there to behold. Perhaps the most famous castle visitor in Scottish history was Mary, Queen of Scots. So prolific were her journeys that it seems you can not trip over a stone in Scotland without it bearing a plaque saying ‘Mary, Queen of Scots stayed here’. From September 1561, Mary embarked on nine ‘progressions’ throughout her realm, with some lasting several months. While she enjoyed leisurely retreats into the countryside, such as at Craigmillar Castle on the outskirts of Edinburgh (where the stink and political intrigue of the city could be left behind) this prolific traveling was really a case of a precarious ruler seeking to consolidate her authority. Queen Mary was no more a ‘tourist’ in Scotland than a modern head of state traversing the country to visit military bases and meet with the heads of local government. By the early 18th century a dramatic shift in the societal role of castles in the British Isles was nearly complete. Innovations in gunpowder weapons had long rendered traditional castle walls militarily obsolete and the grim, draughty towers of old were steadily abandoned in favour of unfortified country houses and châteaux that reflected the relative demilitarisation of domestic politics. The centralisation of state power in this period meant that the need for each lord to directly defend their lands had diminished and so had the need for buildings to serve that purpose. Castles were always in some ways symbolic, but with their functional capacity nullified, their symbolism became the dominant value that guided their preservation and development. It was no longer about what a castle could do; instead, it was what a castle evoked. The end of the castle age gave way to a new role, one geared towards ornamentation, expressing continuity with an often imagined past. The Romanticism of Georgian and Victorian Britain celebrated ‘wild’ and ‘unspoilt’ landscapes, heroic narratives and the nobility of ancestry. 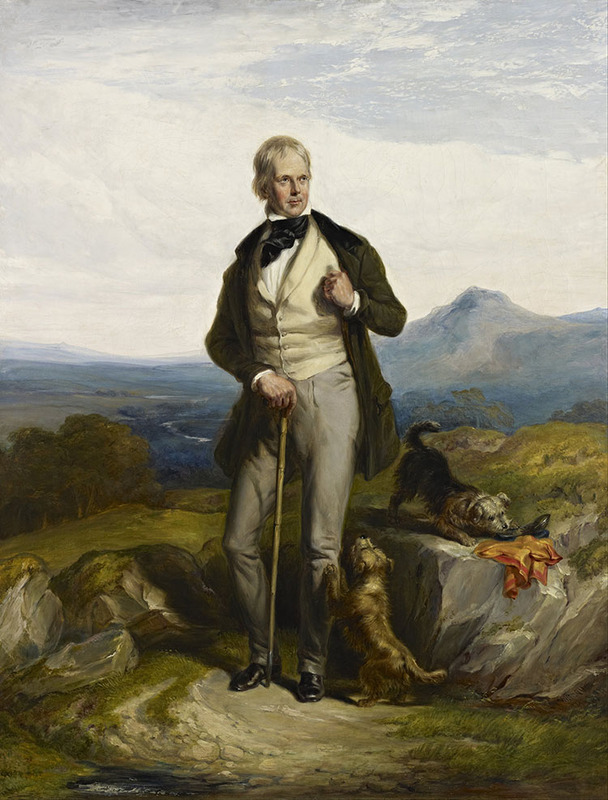 Romantic writers, poets and architects – who in Scotland included Sir Walter Scott, Robert Burns and Robert Adam, respectively – were at the forefront of this cultural movement. As a result, the feelings and emotions that castles elicited in individuals – as well as in kin groups such as the clans, who continued to be violently robbed of their homes and culture during the Highland Clearances – became their main appeal. Ironically, it was the very modernisation that writers such as Scott wrote their popular tales in contrast to that gradually made travelling for pleasure accessible for the first time. The Jacobite Risings were the impetus for the construction of over 250 miles of new roads and 40 bridges in Scotland between 1725 and 1736. Meant primarily to facilitate the pacification of Scotland by Hanoverian monarchs, these new routes made travelling into the Highlands a far less daunting prospect than it had been before. The building of canals from the 1760s and the development of a steamship network in the first few decades of the 19th century further opened Scotland to the world. A farcical fuss in time of war is made to gain admittance into it. The sketchbook and pencil of such an innocent draughtswoman as myself, was, with great solemnity, ordered to be left in custody whilst I walked to the top of the castle, lest I should run away with the plan of this Important Post of Defence. I obeyed orders but laughed in my sleeve at the prohibition of my innocent portfolio. The infrastructure was now there to pave the way for castle tourism, but what actually drove people to pack their suitcases and head into the hills? In short, the same thing that is driving the ‘Outlander effect’, the term for the massive influx of visitors to Scotland’s historic sites in the last few years due to the book and television series Outlander – stories. Shakespeare’s Macbeth drew such crowds to Cawdor Castle that John Campbell, the 5th Earl of Cawdor (1900-70) protested: ‘I wish the Bard had never written his damned play!’ The fact that Cawdor was built over 300 years after the historical Macbeth’s death did not seem to dissuade visitors in the least. No tale held as much sway as those of Ossian, the imagined author of epic poems published from 1760 by James Macpherson. Macpherson claimed to have recorded and translated ancient Gaelic oral histories as the basis for these poems and repeatedly ‘found’ lost manuscripts that formed the basis of his works. Much like Walter Scott’s popularisation of the idea of distinct clan tartans, however, the historical basis for this bold claim was almost entirely invented. This did not stop the lore of Ossian spreading like wildfire across Europe, propelled by the Romantics and not a little bit by the fetishisation of Gaelic culture through the imperialist paradigm of the noble savage. 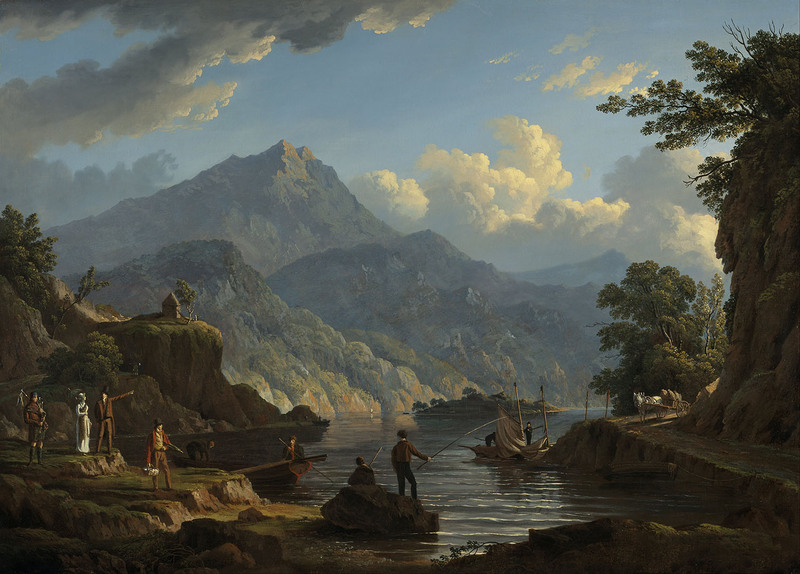 Landscape with Tourists at Loch Katrine, John Knox, 1815. Soon the land itself was bending to the will of those chasing ancient lore and landscapes from their favourite works by Walter Scott such as his poem The Lady of the Lake (1810), in which castles provided important backdrops. Even royalty was not immune. In 1844 Queen Victoria and Prince Albert were guests of the Duke of Atholl at Blair Castle in Perthshire, where they enjoyed hunting, walking, fishing and pony rides. Not far off was the designed landscape of The Hermitage, an aristocratic pleasure ground featuring a stone pavilion overlooking the surging waters of the Black Linn Falls, whose previous visitors included Dorothy and William Wordsworth. Such was Victoria and Albert’s affinity for this Highland castle retreat that they purchased their own Scottish Baronial castle of Balmoral in 1852, which remains a private residence of the Royal Family to this day. The ‘discovery’ of the Ossian poems prompted a rebranding. The pavilion at The Hermitage was dubbed Ossian’s Hall and filled with scenes from the epic poems. An artificial cave was added in 1785 that (of course) was called Ossian’s Cave. Here was a place where Romantics could go to experience a sort of primal, legendary historic landscape, but rather than reflecting a historical reality, The Hermitage was a mirror held up to the values and imaginations of a society that was looking to the past with rose-tinted glasses. Although I am a historian, my attitude towards castles, particularly ruined castles, is purely romantic. Ever since I was a kid I have loved ruins, and loved to explore shadowy staircases and crumbling towers while imagining ghosts and fairytales. What is clear is that the social significance of castles has changed dramatically since their heyday, from being the physical manifestations of power politics to acting as sentimental and personal amplifiers of individuals’ imaginations and identities. 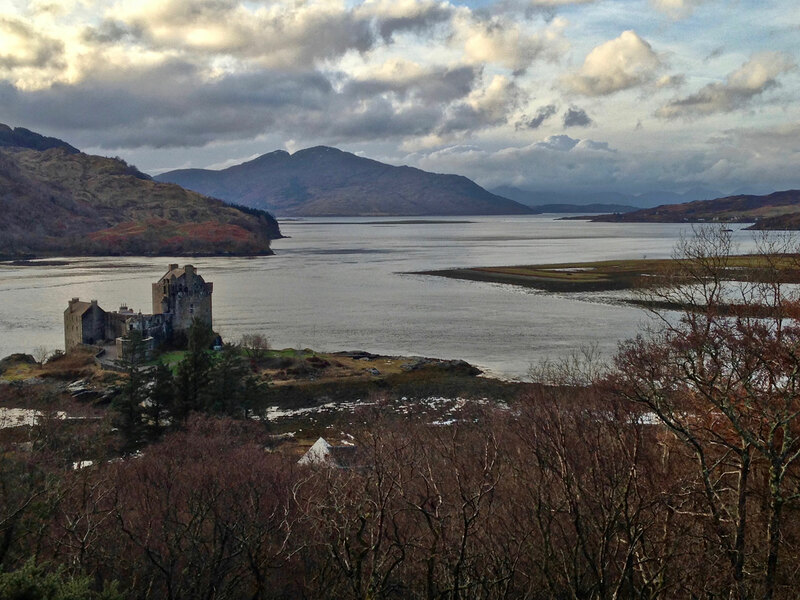 On the first occasion we had been delighted and held by a picture perfect in every detail, for confronting us was the magnificent ruin of the castle of Eilean Donnan, then the most picturesque I have seen on the castle-strewn shores of the west coast … but no such view is any longer obtainable. For returning several years later, I was horrified and repelled by the ruined picture which obtruded itself on the outraged surroundings, the remains of the castle being in the throes of a rebuilding which must permanently disfigure the landscape. A common complaint from visitors to ruinous castles is that there ‘isn’t much to see’ but, for people like Donaldson, that same state of ruin spoke to the transience of history and was thus just as much a part of the romantic landscapes of Scotland as its heathery hills. Castles, both intact and ruinous, are now an integral part of Scotland’s appeal to tourists and locals alike. Historic Environment Scotland, the national organisation that cares for many of Scotland’s best-known castles, has published remarkable statistics about visitor numbers in recent years that show a huge increase in footfall to many of its castles. The source of that increase, as mentioned previously, is pop culture, in particular Outlander. 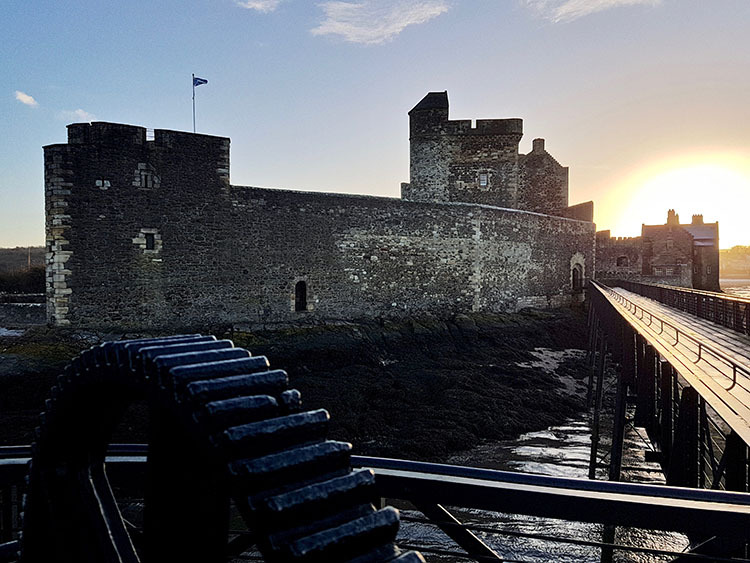 Blackness Castle, which appears in the show as a prison, saw a 72 per cent increase in visitors in early 2017 over the previous year. Doune Castle, long a place of pilgrimage for Monty Python fans due to its significant role in Monty Python and the Holy Grail, has seen a 50 per cent increase in visitors. Other pop culture phenomena, including The Lord of the Rings and Game of Thrones, are regularly cited by visitors as major inspirations for seeing castles and historic sites. Is this any different from 19th-century tourists seeking out the caves of Ossian or the castles of Macbeth? Where architecture has long since crumbled, stories have risen to fill in the mortar. David C. Weinczok is a heritage professional, writer and presenter.